Slip and fall accidents, believed to be the second-leading cause of injuries in the United States, impact the U.S. economy heavily, with millions of dollars spent in hospitalization and medical expenses, and time missed from the workplace. The laws covering slip and fall accidents are complex, requiring many issues to be analyzed before fault can be assigned and negligence (and liability) can be determined. While the majority of these accidents result from improper property design or poor property maintenance, other factors – such as ongoing construction or adverse weather conditions – may come into play. Under the law, property owners are required to take reasonable care in the maintenance of their premises, so that they can avoid the risk of exposing others to the harm of a slip and fall accident – but this isn’t always the case. For instance, if you were not advised with appropriate signs of possible hazards, the establishment where you suffered your slip and fall may be held liable for your injuries. However, it is not merely enough for the property owner to post warning signs; such signs must be clearly visible and strategically positioned to be easily read. Should you suffer a slip and fall accident, you should seek medical help and consult with an experienced attorney immediately. It is important to take plenty of photographs, if you can, and have witness names and numbers for your slip and fall lawyer, as it is important to prove that the owner of the property knew, or should have known, about the slip and fall hazard, and that he failed to correct the problem. If you or a loved one has sustained injuries due to a slip and fall accident, contact Fenstersheib Law Group, P.A., toll-free, at 1-800-TellRobert. We have over three decades of experience in accident and personal injury cases, and we will evaluate your accident claim free of charge and advise you of the necessary steps to secure your legal rights. Our phones are answered 24 hours a day, 7 days per week. 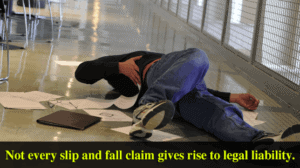 Home > Legal News > Slip & Falls > How Is Liability Determined In A Slip And Fall Accident?